From April 19-21, Pittsburgh Ballet Theatre (PBT) performed Cinderella at the Benedum Center for Performing Arts in downtown Pittsburgh. For an evening, audiences were swept away into an enchanting land far, far away, where the girl falls in love with the prince and they live happily ever after. For an extra-special treat from The Ballet Barre, check out this slideshow of photos of the talented PBT dancers during the final dress rehearsal of Cinderella before opening night! (All photos by Kim Roberts). The PBT dancers put on a stunning performance filled with smiles and glitter, plus a pair of pointe shoes positively dripping in sparkles as Cinderella’s glass slippers. The story of Cinderella has been told and re-told throughout the ages across the world. According to the playbill from PBT’s production, there are more than 1,500 different versions of the fairy tale that have been told through many formats, including ballets, plays, musical, movies, and operas. Click on the graphic above to see the most common words found in the Cinderella synopsis in the playbill! The most popular version in modern day America is the classic Walt Disney movie Cinderella. Take a look at the video below to see a clip of “A Dream is a Wish Your Heart Makes” from the classic movie! The version of the story told in PBT’s production differed from the movie, but not enough to leave audience members confused. In PBT’s production, which was choreographed by Septime Webre, Cinderella lives with her father and two stepsisters, who are played by male dancers. The result is a needed comedic touch that lasts throughout the show and produced plenty of giggles from little girls in the audience. When Cinderella meets her fairy godmother for the first time, the fairy godmother and her helping fairies represent all four seasons as they make Cinderella’s wishes come true. From there, the rest of the story continues as it does in the movie. The overall effect was a mesmerizing one for the little girls and adults in the audience alike. The Prince and Cinderella dance the night away, or at least until the clock strikes midnight. Then she must flee as her beautiful ball gown transforms back into her work clothes, and she leaves behind just one of her sparkling pointe shoes. The prince finds it and travels the world to find the girl it belongs to, finally ending at Cinderella’s cottage and reuniting with her at last. The two are married and live happily ever after. Webre’s choreography showcased the impeccable technique of the PBT dancers with its complex patterns and beautiful pas de deuxs between Cinderella and her prince. Webre, currently artistic director for The Washington Ballet in Washington, D.C., created ballets that have been performed throughout the world. He also performed in the works of many famous choreographers, including Alvin Ailey and George Balanchine, according to The Washington Ballet’s website. Take a look at this map to see some of the North American ballet companies that have performed works by Webre in recent years. The classical music performed by a live orchestra at the production of Cinderella was composed by Sergei Prokofiev, whose music has been a part of the production for more than 60 years. Prokofiev began work on Cinderella the ballet in 1940, but he was forced to stop when World War II broke out. He picked up working on the ballet again in 1943 and finished in 1944. The very first performance of his completed work was performed in Moscow, Russia, by the Kirov Ballet in the Bolshoi Theatre on November 21, 1945, according to Music Academy Online. Check out this timeline to see Prokofiev’s life and his many accomplishments in the world of ballet. The PBT dancers brought this ballet to life in downtown Pittsburgh elegantly. Not only were the dancers themselves beautiful, but the sets and costumes whisked the audience away into a different world. The best performances of the night were the dances between Cinderella and her prince. In the Saturday night production, the leads were performed by principal dancers Alexandra Kochis and Christopher Budzynski. What made their performances special — besides their beautiful dancing, of course — was the fact they are a married couple in real life. To see the two of them dancing together as Cinderella and Prince Charming was a special experience. The two dancers were able to gracefully complement each other and danced as if they were one person, while simultaneously showcasing their own talents as well. 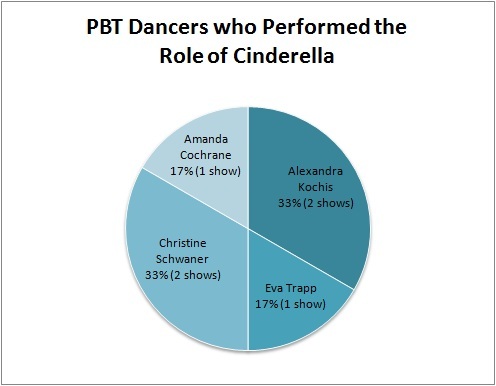 To see which PBT dancers performed the leading role of Cinderella in the company’s six performances last weekend, check out this chart to the left with information from PBT’s website. PBT successfully brought Webre’s choreography and Prokofiev’s score together in a production that flawlessly told the fairy tale that so many have come to love. If you ever have the opportunity to see this version of Cinderella the ballet, I highly recommend it. This ballet is perfect for ballet and dance lovers and fans of the fairy tale itself. It is the perfect way to introduce newcomers to ballet because of its clear, familiar story and happy ending. It was honestly my favorite ballet that I have ever seen because it brought a classic fairy tale from childhood to life and took me away to a world of happily ever after, even if just for a couple of hours. Hopefully you had a good weekend? Did you see any dance performances in the past few days? It was a big weekend for Pittsburgh Ballet Theatre (PBT). The company performed the ballet Cinderella at the Benedum Center for Performing Arts six times over the weekend, and each performance was more magical than the last! Coming soon, The Ballet Barre will have an in-depth look at Cinderella the ballet in Pittsburgh, its choreographer and composer, and a review of PBT’s performance. Plus, get excited for a special photo slideshow sure to transport you to an enchanted kingdom far, far away! Maybe you’ve heard of cecchetti. If so, then you’ve probably learned the patterns, studied the theory, and waited anxiously for your exam results in the mail. Or, maybe you have no idea what on earth cecchetti is or how it could possibly relate to dance. No worries! This post will give you a taste of what the cecchetti method is all about. Cecchetti is a method of ballet created by Enrico Cecchetti, who lived from 1850 to 1928. Cecchetti was an Italian Ballet dancer who lived in Rome and worked to develop a ballet technique that focused on students learning proper placement and poise. Ballet students studying the cecchetti method start in Grade I, where they learn the basics of ballet. 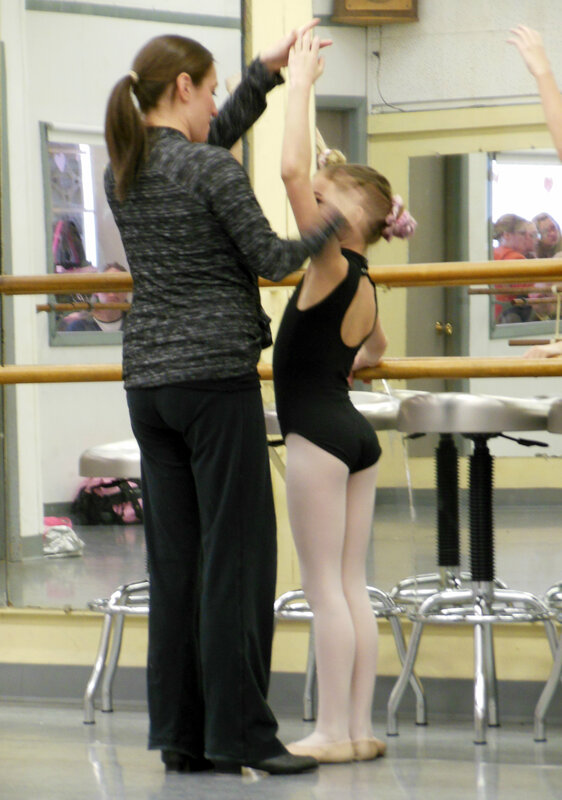 Cecchetti classes consists of barre work, center work, and patterns across the floor. The patterns are laid out in a syllabus for each grade. Because of the structured class material, students can learn the patterns quickly and then focus on breaking down each step and movement in every pattern. Students take exams administered by the Cecchetti Council of America, which includes doing each of the patterns for that grade level and knowing the related theory, which includes the French names for each step as well as their English translations. With each grade, the number of patterns at the barre and in the center increases, the amount of theory knowledge builds, and the technique must show improvement. All exams and classes are done in ballet shoes. 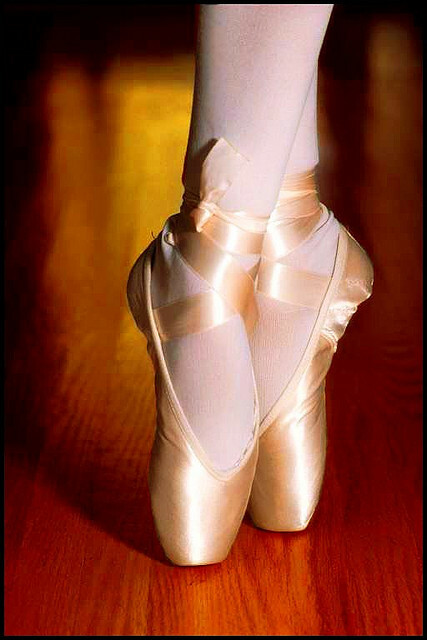 Grade V is the first exam level to include a section in pointe shoes, by which time dancers should have the strength, placement, and proper technique to use correctly. Cecchetti is an excellent way for young dancers to learn the discipline and structure that go into learning the art of dance. The lessons learned in cecchetti classes will carry over to every other dance genre and result in a stronger, better dancer. So the next time someone brings up cecchetti in your everyday dance life, you can join in the conversation! Pittsburgh is known for its talented football players, its skilled hockey players, and its love/hate relationship with its baseball team. But the Steel City hasn’t been quite as well known for its world-class ballet company — something that is changing as the company continually produces high quality shows featuring its highly skilled dancers. Pittsburgh Ballet Theatre (PBT), with its rehearsal facilities located in Pittsburgh’s Strip District, is made up of 27 company dancers from across the globe. The ballet dancers will finish their current season with performances of “Cinderella” with the PBT orchestra April 19-21 at the Benedum Center for Performing Arts in downtown Pittsburgh. But that doesn’t mean that it’s time for a break. PBT recently announced the lineup for its 2013-2014 season, which will consist of “An Evening of Twyla Tharp” in October, “The Nutcracker” in December, “Swan Lake” with the orchestra in February, “3×3” in March 2014 and “Don Quixote” with the orchestra in April 2014. The PBT dancers will be hard at work preparing for the next season. Because ballet is a continual strive for perfection, there is always room for improvement — even with the incredibly skilled dancers in a professional ballet company like Pittsburgh Ballet Theatre. Check out this map mash-up to see where each of the PBT company members is from. Their hometowns range from right here in Pittsburgh to the other side of the globe. Clearly PBT is a world-class company that draws ballet dancers of all backgrounds. What is the most important part of learning to dance? The dance shoes? The music? The recitals or competitions? It all comes down to the dance teachers. Young dancers often grow up in the same studio from age 3 to their high school graduation. That gives their dance teachers the unique opportunity to see them grow and transform as dancers and as individuals. From personal experience, I can honestly say that I had the best of luck in my dance training because — in my extremely biased opinion — I grew up with the absolute best dance teachers in the world. You probably feel the same way about your dance teachers. These feelings just go to show how influential dance teachers are in the lives of their students. I had the opportunity to talk to three of my former dance teachers from Ken and Jean Dance Studio in North Versailles, Pa., to discuss what goes into being a dance teacher. Check out this video package below of my interviews with these three teachers during a typical Friday evening of dance classes in March. Multimedia Video Package: The Life of a Dance Teacher from Kim Roberts on Vimeo. Clearly, these dance teachers absolutely love what they do every single day. Their passion for dance and for their students is evident, and the work incredibly hard to make the classroom experience the very best for young dancers. Through my interviews with them, I found out that being a dance teacher is so much more than what happens in a classroom. For studio owner and teacher Darcy Field, whose parents, Ken and Jean Phifer, opened the studio, her favorite part of her job is the chance to see her dance students grow up in the studio. “I think what I like best is working with all ages and seeing that continuity. I wouldn’t want to work with all young, and I wouldn’t want to work with all advanced. I really think it’s that ability to work with all ages,” Field said. The opportunity for dance teachers to really get to know their students over many years is what makes the bond between dance student and teacher so strong. For teacher Jen Tancraitor, who grew up at Ken and Jean’s herself and then returned as a full-time teacher after college, it is a joy to teach students that she sees every single day for dance class. Dance teachers combine their love of dance and their love of teaching students in the classroom every single day. Their students grow and improve in their technique, their character, and their love of dance every day as a result of their teachers’ love and dedication. 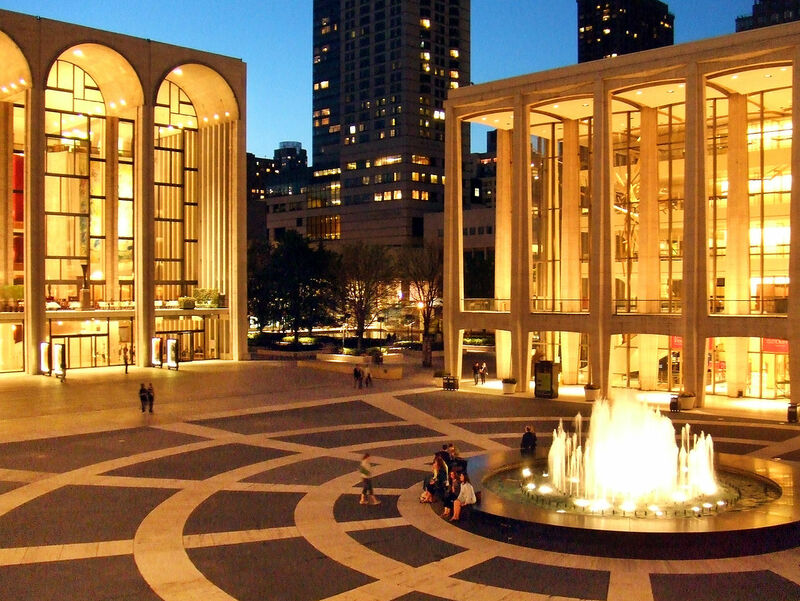 The New York City Ballet is at the top of the list of the world’s esteemed ballet companies. Here is a brief profile of the company, including its history and current information, plus some photos and videos from the company. The idea for the company came from Lincoln Kirstein, who wanted to start a ballet company in the United States that was self-contained, meaning it would train its own dancers through a ballet school and have its dancers perform original works created specifically for them. Together with famed ballet choreographer George Balanchine, Kirstein made his dream a reality when he started a new company in 1933.The company faced great challenges in its beginning years, but it was able to withstand even the struggles that came along with World War II. Esteemed choreographer Jerome Robbins got on board as well, and the New York City Ballet company flourished. It performed in what is now the David H. Koch Theater that opened in April of 1964, and the company has been based there ever since. A unique feature of the New York City Ballet is that it also has a summer home. Every year, the company performs in Saratoga, New York, at the Saratoga Performing Arts Center. In addition, the company has made many trips around the world to perform at various venues in countries such as Russia, Australia, Japan, and South Korea. For more details about New York City Ballet’s rich history, check out the company’s website. New York City Ballet is the largest ballet company in the United States, with about 90 dancers. Choreographers George Balanchine, Jerome Robbins, and Peter Martins contributed to the 150 works choreographed just for the New York City Ballet dancers since the company’s start. The official ballet school of the company is the School of American Ballet in Lincoln Center, which consists of about 350 aspiring ballerinas who study under the watch of the company’s directors and ballet masters. This school feeds directly into the company. New York City Ballet is a company like no other. In fact, the company performs more ballets in a single year than any other company in the world. The 2012-2013 season, for example, includes more than 75 works. For a full list, check out the company’s season repertory. Check out these great videos that give insight into what happens in a professional ballet company, plus some examples of these dancers’ incredible skill and technique! Video #1: This video shows what goes on behind the scenes in a renowned ballet company like New York City Ballet. Video #2: Here is a fun look into a ballerina’s most treasured possession: her pointe shoes. Video #3: Now take a look at New York City Ballet’s “Serenade,” choreographed by George Balanchine. Have you seen the newest McDonald’s Shamrock Shake commercial on TV? Check it out below! Doesn’t that actress look familiar? If you’re a dancer, you might recognize her as Amanda Schull, the actress who played Jody Sawyer in the 2000 dance movie Center Stage. Schull has made plenty of TV appearances in recent years with roles on shows such as Pretty Little Liars, Suits, Psych, Grimm, and Two and a Half Men. The St. Patrick’s Day-themed McDonald’s commercial made me want to watch Center Stage again since it’s been a while. Here is my review of the movie that’s a timeless classic for ballerinas everywhere. 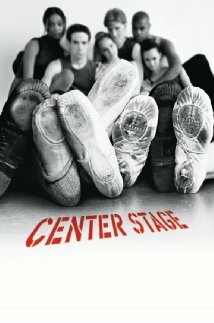 Center Stage follows young ballet dancer Jody Sawyer and a group of her friends through a year at the esteemed American Ballet School in New York City, from auditions to the year-ending showcase that serves as an audition for the country’s most prestigious ballet companies. Jody faces many challenges throughout the year — her less-than-perfect turnout and feet are continuous detriments to her technique, and other dancers are always better than her. Jody dedicates her mind, body, and soul toward making herself the best ballerina she can be, and she is cast as the lead in Cooper Nielson’s (a famous ballet dancer and choreographer) ballet in the showcase. Jody deals with love and loss throughout the process of preparing for the performance, but she ultimately performs flawlessly in the showcase. She lands herself a principal dancer position in Cooper’s new ballet company, and she finds inner strength and confidence that give her a new and improved outlook on life and dance. Jody’s friends also face challenges like attitude problems, finding their own dreams, and injuries that make them stronger people and dancers who are finding their place in the world.